I'd love to know how many of you rolled your eyes after reading the headline above. It certainly deserves such a reaction--thanks to the ever-changing (and ever-discussed) contents of my gaming wish list (which currently includes everything from a copy of the PC Engine cute 'em up, Coryoon, to the ill-fated Sega CDX). 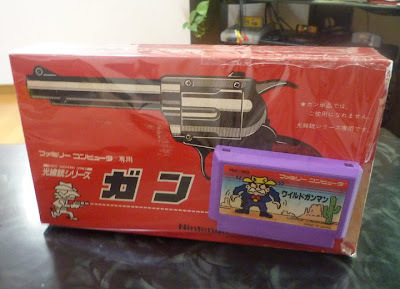 Anyway, you're probably wondering why I recently added the Famicom light gun--the Japanese version of the NES Zapper--to that list. To be honest, I've had at least one eye on this accessory since I came across one on eBay last year, but it didn't completely capture my attention until yesterday, when I saw the following photo over on famicomblog.blogspot.com. That tomato-red box houses the more-realistic-looking-than-the-NES-Zapper Famicom light gun, by the way, while the purple cart is a loose copy of Nintendo's Wild Gunman title. Click on this link to read more about both of blogger Sean's recent purchases. Also, click on this link to see a fantastically retro (and regrettably fuzzy) Japanese TV commercial for this playful peripheral. Are you mainly sticking to Wild Gunman when you play with it, Sean, or do you have others -- like Hogan's Alley? Finally: Did you know that another of Nintendo's gun games, Gumshoe, was released in Europe and NA but not Japan? I wonder why? Interesting about Gumshoe, North Americans complain about all the stuff they missed out on which was only released in Japan, but sometimes it worked the other way around too! Yeah, I didn't have much experience with Hogan's Alley or Wild Gunman when I was a kid either, Sean. I do remember renting Gunshoe once, though -- it was hard! It was like an auto-scrolling platformer, if I'm remembering correctly, and you had to shoot the protagonist to make him jump. I sucked at it :) Still, I'd like to play it again someday -- along with the other two games. Anyway, can't wait to hear about your acquisition of Duck Hunt! I've never even heard of Gotcha! Justin. Who made it, what was it like, etc? The goal is to destroy the source of the aliens by bombing it. Try to get more money by destroying these aliens and their base. Pick up powerups and buy new guns. Strategy would be to try and kill lots of aliens to gets funds for your guns. Destroy their base if you want to end the level. Have Fun! A fun game for the casual gamer. Easy to play yet addictive. Aim your anti aircraft gun and shoot down the attack helicopter gunships. Challenge increases each level as the gunships fly faster and drop bombs on you. Shoot the bombs to defend yourself. App2SD supported. Tablet Ready. blog really brought some things to light that I never would have thought about before reading it ..
Really i am impressed from this post....the person who created this post is a genius and knows how to keep the readers connected..unique site and interesting too… keep it up…looking forward for more updates.